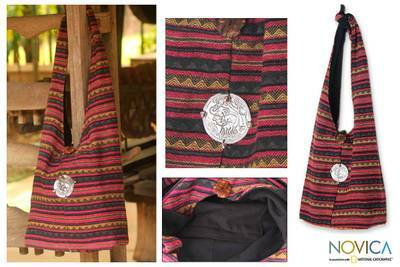 Handmade Striped Cotton Shoulder Bag , "Antique North"
With a strap that is designed to tie at the desired length, this bohemian shoulder bag is a beautiful testimony to northern Thailand's textile traditions. The cotton bag is woven on a traditional loom by Karen hill tribe weavers in pink magenta with patterns in black, yellow and gray. Adorned with elephants detailed in aluminum repoussé, the bag by Jiap Rojjana has a pocket in the solid black lined interior and closes with a coconut shell button. 100% cotton, aluminum, coconut shell. Cotton lining.